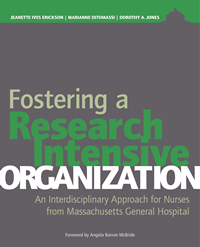 Munn Nursing Research Grand Rounds occur quarterly in the Robbins Auditorium at MGH. Presenters include past recipients of the Yvonne L. Munn Nursing Research Award as well as Nurse Scientists from throughout the MGH Community. **Speakers and topics to be announced. Grand Rounds will resume in October 2018. Please watch out for email announcements, or contact Stacianne Goodridge, sgoodridge@partners.org for more information. SAVE THE DATE for Abstract Writing Classes in preparation for Nursing Research Day 2019!! Nursing Research Day was a great success this year! Clink on the the link below to read an overview of the day on the MGH Research Institute blog. Dorothy A. Jones, EdD, RN, FAAN, FNI, is a Senior Nurse Scientist and Director Emeritus of the Yvonne L. Munn Center for Nursing Research. Developing new funding sources, partnerships, team-building, and engagement in multidisciplinary research activities.